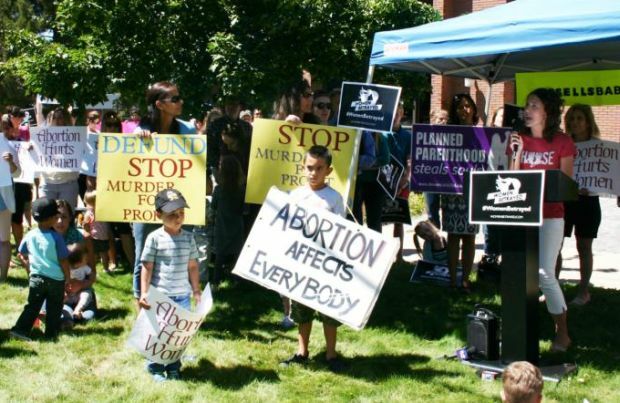 SALT LAKE CITY — Pro-life advocates from across the Salt Lake Valley rallied peacefully in front of Planned Parenthood July 28, calling for state and federal officials to investigate and defund Planned Parenthood. The crowd joined pro-lifers across the nation in holding a “Women Betrayed” rally, an effort organized by Students for Life of America and its partner organization, Pro-Life Future. Rallies took place in about 65 cities across the nation. “Defund Planned Parenthood — now,” shouted the Salt Lake City crowd. Across the country in Iowa, about 100 people abandoned their lunch hour to publicly witness their opposition to Planned Parenthood. Their “Women Betrayed” rally was held at Mary’s Choice, a pregnancy resource center, located next to Planned Parenthood of the Heartland in Sioux City. “We came out today to demand that our representatives in Washington, D.C., and Salt Lake City hold Planned Parenthood accountable for their actions, and we are not alone in our fight,” Callie Oppedisano told the Salt Lake City crowd. She co-chairs the Knights of Columbus pro-life committee with her husband, Joe, at St. John the Baptist Parish in Draper. A local Knights council helped organize the rally. She was referring to a series of recently released videos showing Planned Parenthood discussing ways to do abortions that would salvage fetal tissues and body parts for researchers. Planned Parenthood disputes what the videos show, saying they were severely edited to distort what was said on tape. Others speakers at the Salt Lake City rally said they also are committed to abolishing abortion. Jesse Craig, vice president of Right to Life at the University of Utah, said 94 percent of Planned Parenthood services are dedicated to abortions. According to 2013 data, the latest available, Planned Parenthood says abortions represent 3 percent of the total services its facilities provide. Millions of women across the country rely on Planned Parenthood for contraceptive care, many who otherwise couldn’t afford it. Planned Parenthood also provides limited testing for sexually transmitted diseases and cervical cancer screenings. In Craig’s view, Planned Parenthood’s “main goal is to strip the humanity from a person just because that person is not fully developed and cannot speak in defense of him- or herself,” she said. Also attending the rally was Sam Akins; he and his wife have five children. They learned from their fourth child, who had a severe heart defect, that “love prevails” when life is given a chance, he told the Intermountain Catholic, newspaper of the Diocese of Salt Lake City. Before the Akins’ daughter was born, they were given three options: heart reconstructive surgery, palliative care or abortion. Despite fearing the uncertainty of her survival, the stress of caring for her and the financial burden of her high-risk surgeries, the Akinses chose to give birth to their daughter in 2012. “I knew the moment Rita was born she was given to us to serve a purpose,” Akins said. Following three major surgeries, Rita died when she was 6 weeks old. They declined to be interviewed for this article but handed out a folder of information about the organization’s services. In Sioux City, rally-goers chanted back and forth: “Planned Parenthood, Defund” and “Pro-choice, that’s a lie, Babies never choose to die.” They called on the government to stop funding the organization. Sioux City Bishop R. Walker Nickless opened and closed the event with prayer, thanking God for the opportunity to witness to life. “I hope that in my time as bishop, and our time here, this building next to us will be closed,” he said. 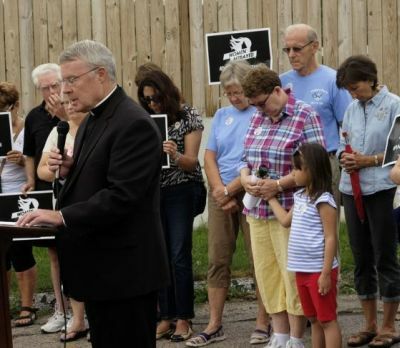 According to Fred Shellabarger, assistant director of adult catechesis and family life for the Sioux City Diocese, the purpose of the rally was to call on state governments to investigate and defund Planned Parenthood. Carol Remer of Battle Creek, who has been a sidewalk counselor outside of Planned Parenthood, emceed the event. Iowa state Sen. Bill Anderson, a Republican from Pierson, shared his response to the videos. Young is on the staff of the Intermountain Catholic, newspaper of the Diocese of Salt Lake City. Contributing to this story was Joanne Fox, managing editor of The Catholic Globe, newspaper of the Diocese of Sioux City.